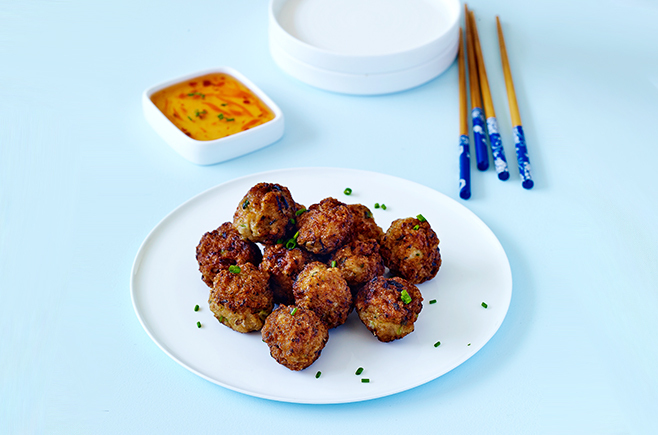 Ready in just 15 minutes our gluten-free fish balls are sure to become a family favourite. Place all ingredients except oil in food processor. Pulse until chopped and combined. Roll teaspoons of fish mixture into balls. Heat 2-3 cm oil place in a frying pan, add fish balls and shallow fry for 2-3 minutes. Remove from oil and drain on absorbent paper. Serve with dipping sauce if desired. This recipe for gluten-free fish balls first appeared in Issue 12 of Australian Gluten-Free Life magazine. For more yum cha inspired gluten-free recipes pick up a copy today.